Cut the stems every 2-3 days. By cutting the stems of your flowers about 2 inches from the end of the stem you allow the flower to take in water more easily. If your flowers are set outside of water for more than 10 minutes, you will need to cut the stems. Also, if you receive a wrapped bouquet, you will need to cut the stems and place them in water as soon as possible to avoid wilting. Cut the stems at an angle as pictured. Remember to use clean garden clippers or shears and not craft scissors. Craft scissors crush the stem and reduce its ability to take in water properly. Change the water. Changing the water helps to avoid bacteria buildup. When the water isn’t changed a smelly and slimy buildup occurs around the stems and coats/discolors the vase. Rinse out the vase and, if needed, wash it out with soap and water (especially if you see any slime buildup). 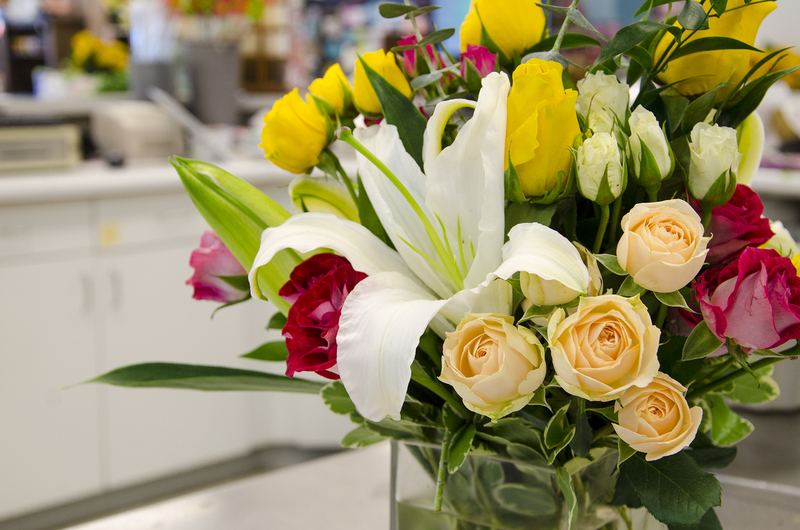 When putting your flowers back in the vase, make sure there are no leaves or debris below the water line. If you have flowers that are tightly budded, using warm water sometimes helps those flower buds to open. Keep away from light and heat. Unlike most potted plants, fresh cut flowers prefer minimal light and cooler spaces. Be sure to keep your arrangement away from bright windows, heaters, and drafty areas. Ethylene gas from fruits such as bananas will also shorten the life of your cut flowers. There are several tricks out there that suggest unique methods of vased flower care, but we believe these few simple steps will help extend the life of your fresh cut flowers as well as that special feeling that comes along with receiving such a beautiful gift.